Photos by Joe Mazza, Brave Lux Inc. This slogan of the Ministry of Truth (Minitrue) in George Orwell's novel, 1984, sums up the themes of Newspeak, doublethink, censorship and repression that permeate his novel. Steppenwolf for Young Adults recreates this dystopian era and gives it a strong contemporary twist in its new staging of Orwell's 1949 novel. It's a provocative play and brought out some thoughtful questions from high-school-age audience members at the Saturday afternoon opening. 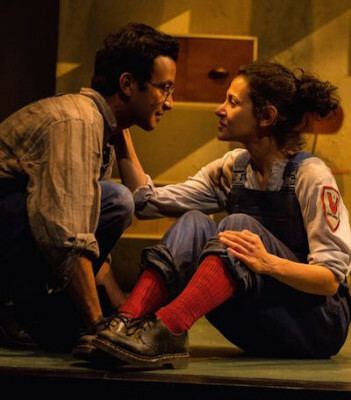 Andrew White's careful adaptation of 1984, directed by Hallie Gordon, brings the story to life in the person of Winston (Adam Poss), who secretly hates Big Brother and the IngSoc party, misses chocolate and fears rats. He lives in Oceania, one of the world's three great powers, and works for Minitrue, an organization dedicated to erasing the past and discouraging memories. Winston changes past news reports to match new government edicts and replaces images of those declared unpersons. When he and Julia (Atra Asdou) meet and fall in love, their actions break all the rules of the party, which has obliterated love, warmth, pleasure and intimacy from the world. Winston does have memories, however, despite the party's wishes; he remembers that he was a child once and had a family. When he and Julia find a secret place to meet, she brings delights such as chocolate and real coffee that remind him of the past. Unfortunately, their precious times away from a telescreen end too soon. Winston is imprisoned by IngSoc, where he is tortured into giving up his memories and admitting that 2+2 might equal 5. Steppenwolf's 90-minute production is a crisp and chilling reminder that we are all under constant surveillance, even if we don't have a telescreen in every room monitoring our thoughts and actions. And although no one we know of is currently creating a dictionary of Newspeak, every day some term becomes politically incorrect and subject to hate-tweets. Gordon's directing is sharp and compelling for this rather complex and emotional story. 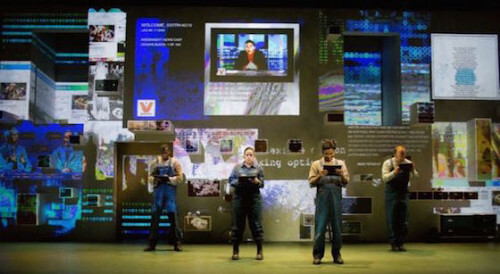 Her cast is capable from beginning to end, with particularly strong performances from Poss as Winston, Elizabeth Birnkrant as Syme, the Newspeak expert, and Lance Baker as O'Brien, the government functionary/chameleon. The face of Big Brother on the screen throughout the production is that of Robert Breuler, veteran Steppenwolf ensemble member. Orwell's book has been a frequent class assignment for generations. It's a challenge for directors and designers to create a visual concept for a story that we have all read and visualized in our own way. Collette Pollard's scenic design combined with Joseph A. Burke's projections, Joel Moorman's photography and Andrew Rovner's sound design and original music turn a simple staging into a masterful blend of sight and sound. The three walls are pocked with drawers, pullout shelves and a Murphy bed. Film projections are used to change the scene of the action from a bureaucratic office to a moving train to a "prole" neighborhood where Winston prowls in an old shop. Two life-sized cubes cut into the wall with the omnipresent telescreens serve as a claustrophobic home for Winston and occasionally for young Winston (Matthew Abraham). The wall changes from a single massive screen to a grid projecting government newscasts, messages and war reports. Projections create the "exerthenics" instructor who summons the "twenties and thirties" to their workouts each morning, and the Two Minutes Hate at regular intervals. The Hate is a terrifying moment in which all join in screaming and rage at the screen showing the enemy leader, Goldstein. Orwell wrote the book ostensibly as a warning of what was to come, but he was also warning his contemporaries that the post-World War II world was in danger of turning into a totalitarian society, threatened by Stalinism and fascism. The rise of McCarthyism in the US a few years later confirmed his predictions. Today the constant surveillance and persistent wars portrayed in 1984 give the story a new currency in this era of the NSA and unending Middle East conflicts. Leaks of NSA documents have told us that pretty much any phone call, email message or text that we send might be intercepted. Orwell's 1984, its vocabulary and themes have been ubiquitous in popular culture, as is the term "Orwellian." The novel has been recreated for film, television, radio and opera. The excellent 1984 film version, starring John Hurt and Richard Burton, depicts a decayed and trash-filled city in washed-out tones of gray with only an occasional touch of color. That film, directed by Michael Radford, was critically acclaimed and received a British Film Award. (The Steppenwolf adaptation closely follows the plotline of that film.) Apple introduced its Macintosh computer during the 1984 Super Bowl with its iconic "1984" commercial. The commercial and the Macintosh launch are portrayed in the new Danny Boyle film, Steve Jobs. Big Brother and the Thought Police have been common themes in albums produced by artists such as David Bowie, the Eurythmics, Rage Against the Machine, Bad Religion and Radiohead. White's 1984 script won a Jeff award for best adaptation in 2004, when Lookingglass Theatre, where he is a founding member and artistic director, staged it. The script was revised for the Steppenwolf production, according to director Gordon. Technology applications were updated and hints of climate change added. Also the young Winston character, who appears in the book and in the 1984 film, was added to the script to "add warmth and a kernel of hope." George Orwell's 1984 continues at Steppenwolf Theatre, 1650 N. Halsted St., through Nov. 20 with four public performances each weekend at 7:30pm Friday-Saturday and 3pm Saturday-Sunday. You can buy $20 tickets online or by calling 312-335-1650 for public performances. Performances for school groups are held at 10am Tuesday-Friday. Call 312-654-5643 or email Jared Bellot at jbellot@steppenwolf.org about school groups. The play is recommended for ages 14 and up. James Brod, a senior at Guerin College Prep in River Grove, contributed to this article. Posted courtesy of Nancy Bishop and Gapers Block.